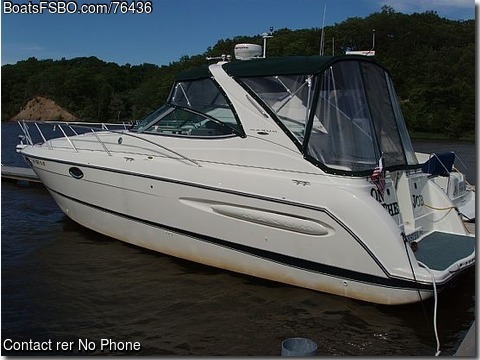 **PRICE REDUCED** Nicely appointed cabin cruiser in Very Good condition with low hours! Raymarine color LCD radar/GPS/chartplotter, fuel flow monitor, anchor windlass w/ 30ft chain, remote spotlight, SS props, trim tabs. Full camper canvas, cockpit wetbar and icemaker. Spacious cabin features sleeping arrangements for 6, glass cooktop, corian counters, microwave, VCR, DVD, 6-disc CD changer, and lots of stowage.